So it's been awhile since I did an installment of Being Bipolar. Like, more than a year. Much has happened since then. Mom passed away. There have been other family and friends that have also left us. But also, many new family and friends have come into my life as well. I've been able to do the first bit of serious traveling that I could enjoy in a long time. I finally have that female miniature dachshund that I've been threatening to possess. The second most important thing that's happened is that God brought a very wonderful, sweet, godly and beautiful woman who I am madly in love with into my life... and for some reason or another she seems to be madly in love with me too. Most important, is that I can see now how everything that I have gone through has drawn me closer to God than I've ever been before. Are there regrets? Yes, absolutely. Regrets that I can't doubt I will continue to carry with me until the end of my days in this broken world. But I have also seen God's wonderful hand at work, that He has always been holding me. I would have to say that one reason for the absence of writing about the bipolar has been that, I was able to let go of some things that were beyond my control. Things that I was desperately trying to fix and could not. And I had to finally acknowledge to myself and to Him that "God, I can't do anymore. I've done all I can. This is Yours to handle. Take it." I had to reach a point of complete physical, emotional and spiritual exhaustion from my own efforts, and do what I should have done months earlier: lay that burden down before God, not knowing or even caring what He might do with it. How could I have possibly known that He was preparing me to have so many good things? In spite of it all, I was able at last to forgive myself for the wrongs I had done and for the things which went wrong that I could not have prevented and yet carried the burden of. And when I did that I was able, for the first time in my life, to experience the utmost joy of the grace of God. I would go through it all again, if I had to, to reach the place where I am now with Him. With where He has put me. With where He is taking me still. What have I been doing for much of this last year and more? Beholding His mighty hand. I would say that all things considered, this past year has seen me able to be happier than I've ever been at all before. And still lurking in the background of it all is the mental illness that nearly two years ago I publicly disclosed that I have. In one way or another, bipolar disorder has factored into nearly every major aspect of my life and way too many smaller ones. In fact, even as I write this I am experiencing a bipolar depressive episode. It makes putting my thoughts together and being motivated to write much more difficult than it would be for me under "normal" circumstance. It's one of the reasons why I haven't composed a Being Bipolar post all this time: so many false starts that I couldn't push myself through to complete. My mood is drastically more stable than it was over a year ago. Sometimes I've wondered if it might have been a good thing to wait this long before another Being Bipolar. In the short term you can't see much change one way or another. Only in retrospect, when you're able to study the data over a prolonged period of time, can you be confidently assured that yes, you really are observing yourself getting better. There are new strategies that I have discovered and developed since last time that help me keep the bipolar in check. I'm going to be talking about some of those during a future installment. One of them, well... let's just say that it would be totally cool with me if a certain piece of software could get ported to the iPad so I could take my "therapy" wherever I go. And then, there is the matter of my having gone public about bipolar disorder. Ever since I began this series and because of the coverage it received from Fox 8 WGHP, many people have written me to express tremendous amounts of appreciation and gratitude. Very often it comes from individuals who also must contend with bipolar disorder, either themselves or because they have to watch a loved one suffer from it. To have heard from so many, to be shown in some small way that this has made a positive impact in the lives of others, has been some of the best therapy I can imagine. Revealing my bipolar disorder and choosing to chronicle my battle through this blog has turned into all kinds of curious blessing. And it has brought a huge sense of liberation with it. I'm no longer having to hide something that shouldn't be hidden away to begin with. Instead I'm free to confront it, to be bold in attacking it. This was something that I was born with, had no choice in being afflicted with it... but I'll do whatever it takes to control it. Maybe that's why God let Mom pass when she did. One close friend told me after the funeral that Mom was able to see me take back my own mind and my own life. If so, then I will have to count that as one more "wink from God" among the many that have happened these long several months. Most of this probably sounds remarkably easy to someone who doesn't have a mental illness. It has been anything but. I'm not deluding myself into believing that I will ever totally conquer bipolar. It's something I have to take responsibility for every day. Sometimes more than that. And I'm going to have to keep taking responsibility for it all the rest of my life. I wish that I could have had my condition this much under control years ago. It would have no doubt kept me from getting hurt. It would have kept me from hurting many other people. My life would have probably turned out to have been radically more successful than it has been. Yes, what if I had been able to address my condition far more early? What if I had never suffered bipolar disorder at all? I'm going to share my asking "What if...?" because I have wondered about it. Have and even now been many times tormented by those questions. Being able to enjoy life for the first time without bipolar wrecking havoc with it, has in some ways wrought a suffering almost as bad as the bipolar itself. There is a second front in the war for my mind. One that in recent months I've found myself fighting as fiercely as against the bipolar: doing my best to not dwell upon what might have been. I don't do "fake". I don't believe in "fake". If there has been any purpose at all to the strange weird path that my life has taken, it is to strive toward that virtue which the Bard articulated in Hamlet: "To thine own self be true". I am an ongoing experiment of the human condition, just as you are along with everyone else in this world. If a mental illness is what I have been dealt, then I will be honest about it, about all of it. I am not perfect and I'll never claim to be perfect. Whatever mistakes I make along the way, I'll own up to them if I haven't done so already. Some people have tried to seriously convince me to take a stab at politics again. I doubt now that will ever happen. Too many people want an "ideal" candidate... and that's not me. Coming out with bipolar disorder has no doubt disqualified me from a lot of opportunities: maybe not officially, but in other ways. What would my life have been without my own mind turning against itself? What opportunities could have opened up, absent the bipolar? What if I could have been a successful writer, or filmmaker, or lawyer, or scientist? My interests are vast and sundry. My mind enjoys contemplating so many fields of study and yet has been kept in one way or another from pursuing them as much as I... as I... would have wanted. What if I had been able to already be the husband I always wanted to be? What if I could have been a father already? Two words that plague me when I'm alone at night. And most of the time those are followed by another word: "Why?" "Why, God? Why did You let me have this?" He never tells me anything but the same thing again and again: "My grace is sufficient." But what if I could live my life all over again, only this time without the bipolar? There was an episode of Lost where the survivors still on the island were propelled backward in time, to a night when they could have potentially changed the course of their fortunes. Locke knew that, but he refused to do it. It would have saved him a lot of pain, Sawyer reminded him. "No, I needed that pain," Locke replied, "To get to where I am now." Maybe I needed all of this pain too. Including the pain of a mental illness that I would not wish upon a worst enemy. Maybe what I consider to be a good life wouldn't be the best life that I could have had accompanying that pain. Kristen reminds me that if that had been for the way I've had to live with bipolar, we might have never met at all. She doesn't have to tell me the rest: that I would have missed having that happiness. Neither would I have possibly been drawn into the deepest and most wonderful relationship that I have with God today, without letting myself discover His grace and mercy at the end of that suffering. I can't know what might have been. My heart knows that. My head... is learning it too. I shouldn't regret where life would have taken me without the bipolar. I can only look forward to what will come of my life now that I have it under control, now that I'm learning with each new day how to make sure that it never again hurts me or those closest to me. Fighting against my mind while also fighting against my doubts. And trusting God to not let me fall along the way. I don't know if some people would consider that to be a "good" life. But it's certainly not a boring one. And from where I'm sitting tonight, depressive episode and all, looking back on where I've been and what I've gone through... it gives me a tingle to think about what God might yet have for me. Maybe someday, long years from now, I won't have to ask "What if...?" or "Why?" anymore. On that far-flung day, the only thing I want to be telling God is, "What a great ride that was!" Well, now that I've finally got Being Bipolar back up and running again, what can be expected in the near future? More videos, no doubt. Heck, I still haven't made one with my iPad (and there's a wazoo of video apps on it that are begging to be employed!). Most of the times that I've tried to write about bipolar this past year were about the normal (more or less) routine that I go through to manage it. I'm able to do that now, and at least one thing I want to elucidate upon might arouse some chuckling from you, Dear Reader. 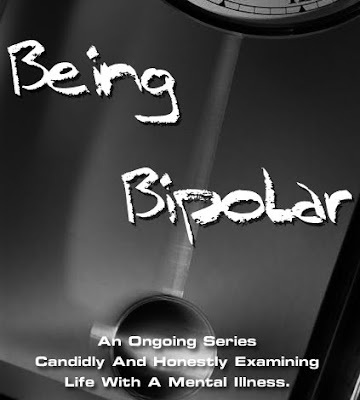 I also am feeling led to write about what bipolar disorder does to the ones that you love. Something that I have ample experience in regard to (unfortunately). But I've promised myself that I'm going to delve into this no matter how heartbreaking or painful it may be. One person already wrote to tell me that this series helped him to understand his wife's bipolar. Who knows: maybe this can save some relationships out there. If it does then I can't take credit for it. The work is ours, but the results are God's. One thing that I knew but didn't realize how pervasive it is, is how many creative and artistic types out there are afflicted with bipolar. Okay, my own creativity has taken a hit too from this thing, but I'm gonna do my darndest to write about that and how I've been striving to get it back. I think it might be working 'cuz for the first time in awhile I've some new short film ideas. A few writing projects, too. So if producing this series is aiding me in finding my Muse again, so much the better for me. And I'm more than happy to use that to help others as well. So keep your earballs and eyedrums wide open, 'cuz we're gonna hurtle even deeper into this blogger's strange and twisted mind! I can't promise you'll exit at a gift shop, but I'll do my best to educate, enlighten and entertain along the way. Sorta like Jerry Lewis! At least before he got canned. Chris I found your blog last year after seeing it on the Buckley Report on Fox 8. You are very courageous for being open and up front about your fight with this disease. Thank you. Have you considered public speaking engagements? "Have you considered public speaking engagements?" I'm thinking that could be a lot of fun! We'll see. You have nothing to be ashamed of Chris. You have one of the rare blogs I read every day and I've always enjoyed your outlook and perspective. I would have titled this post, 'The Chris Knight Rises'! Thank you for doing what you are doing Christopher.